FC Barcelona’s main sponsor Rakuten have announced that they are putting on an exhibition of Barça shirts from throughout the Club’s recent history. The display begins on Friday 19 January and will carry on until 31 March and included 48 jerseys starting from the 1980/81 season until the 2013/14 campaign. 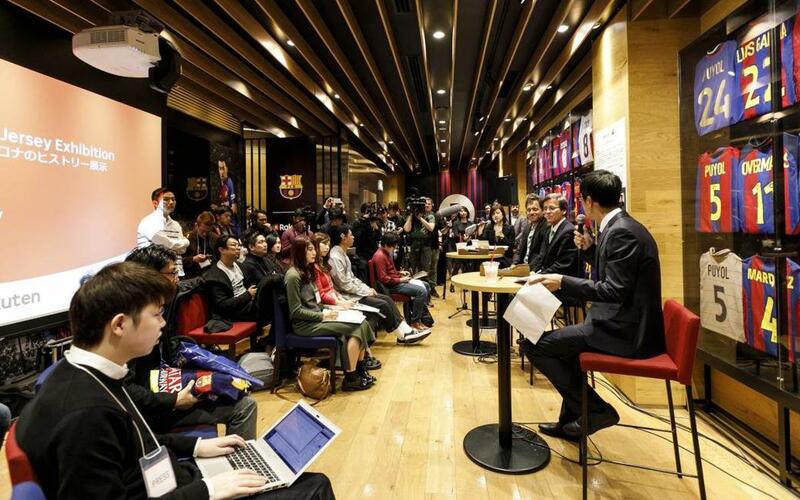 The exhibition takes place on the third floor of the Rakuten Café in the Shibuya district of Tokyo which several Barça players visited last summer and is being supervised by the FC Barcelona Museum with the help of Agesilaos Papadopoulos, one of the top collectors of football shirts in the world. Papadopoulos has loaned the exhibition 48 shirts, the first time outside of Barcelona. The last time they were put on display was at the FCBotiga, the Club’s official shop, in the Sagrada Familia area of Barcelona. The shirts belonged to Barça legends such Pep Guardiola, Xavi Hernández and Carles Puyol as well as current players such as Leo Messi, Andrés Iniesta and Gerard Piqué. As a complement to the exhibition visitors can also enjoy interactive contents via mixed reality technology developed at the Rakuten Institute of Technology. As such the public can enjoy footage of the players wearing the shirts on display in the exhibition and also watch videos explaining the nature of the agreement between Rakuten and FC Barcelona.